U.S. criticism of India’s close relationship with Iran is shortsighted. Though President Donald Trump’s decision to withdraw the United States from the Iran nuclear deal has embittered its European allies, it was welcomed by Iran’s rivals in the Middle East — in particular, U.S. allies Saudi Arabia and Israel. U.S. economic sanctions on Iran are expected to go back into full force by November 5. In the meantime, other signatories to the Joint Comprehensive Plan of Action (JCPOA) are looking for ways to save the deal. The U.S. decision will have profound consequences for politics in the Middle East and beyond. India — having close relations with both Iran and the United States — is a case in point. While not a signatory, India welcomed the JCPOA and the lifting of international sanctions against Iran. 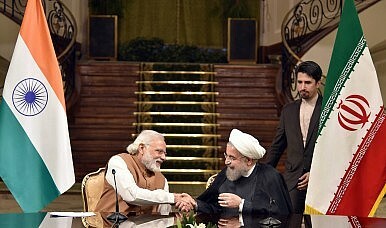 Iran has remained one of India’s most important partners in the Middle East since an opening of relations in 2013 when both countries formalized their “strategic partnership.” India and Iran share an interest in countering Sunni extremism — especially in Pakistan and Afghanistan — and Tehran is of strategic importance to Delhi’s expanded influence in Asia through joint connectivity projects and countering China-Pakistan ties. Tehran, faced with international pressure and rivalry in its immediate neighborhood, needs as much support as it can get from long-standing partners like India. By pressuring allies to isolate Tehran, Washington’s actions force Delhi to pick sides between the United States and Iran, further complicating India-Iran ties. Ensnared in competing interests and the impact of renewed sanctions, India must balance protecting its national interests by working with Iran on key issues while, at the same time, downplaying its ties with Iran to placate the United States. These opposing interests impede India’s strategic options — in particular, vis-à-vis China, a rising hegemon in the region, and ultimately, undermines U.S. strategic interest in Asia. Prior to the Iran deal in 2015, India was slowly weaning itself off Iranian oil amid increased international sanctions. Iran was India’s second largest supplier of crude oil at the beginning of the decade; by 2015-2016, Iran was only India’s sixth largest supplier of oil. However, the signing of the Iran deal and the easing of its sanctions made business with Iran more tenable, leading Iran to jump up to be India’s third largest supplier of oil in 2016. India is also Iran’s second largest consumer of oil. It is unclear whether India will successfully be able to cut Iranian imports to zero, given its domestic energy needs and if the cut down will affect other areas of India-Iran cooperation. Strengthening connectivity with the Central Asian and Eurasia regions by bypassing Pakistan, its hostile neighbor, has been one of India’s main strategic priorities in recent years. The strategy’s centerpiece is the transport corridor connecting India to Iran, Russia and Europe — the International North-South Transport Corridor, of which the newly operational Chabahar port is a major component. Chabahar, into which India has invested $500 million is a counter of sorts to China’s investments in Gwadar, Pakistan. Not only have sanctions affected the timeline of the already delayed development of the port, they have also incentivized Iran to solicit support from China and Pakistan for the project to hedge against Delhi’s investment. While an immediate partnership between Iran and Pakistan is unlikely, Iran’s move serves to pressure India, which, despite possible sanctions relief, is struggling with the project’s sluggish progress on one hand and an intensifying competition from China on the other. Punishing India for the hostilities between Iran and the United States not only impedes India’s influence in the region but drives Beijing and Tehran closer. The Sino-India relationship has been fraught with various challenges and pressure points. Despite the positive steps Narendra Modi and Xi Jinping have taken to “reset” the bilateral relationship — a little over a year following the Doklam standoff — the Indian Parliamentary Committee has most recently called for leveraging all options (such as Taiwan) to counter Beijing’s “muscular” approach in border disputes. A recent public opinion survey showed that more than 40 percent of Indians thought that China posed a threat to the country. India’s neighbors — such as Sri Lanka, Pakistan and Nepal — increasingly have been taking Chinese loans that allow the Asian giant to gain important footholds in India’s immediate neighborhood. India is feeling increasingly boxed in. At a time when India’s relationship with its close neighbors is fraught with challenges, the scope and depth of India’s strategic options has come under new strain with reinstated U.S. sanctions against Iran. U.S. engagement with India has continued to deepen in recent years. With the labeling of China as a key challenger to American power and the creation of the open and free Indo-Pacific strategy, of which Delhi is cornerstone, Washington continues to view Delhi largely through the prism of its current affairs with China. The strengthening of U.S.-India political and military ties is evident in high-profile engagement, including the annual joint naval exercises for maritime security and the bilateral 2+2 high-level dialogue mechanism. By weakening Delhi’s strategic position in the region, renewed sanctions on Iran effectively rewinds the momentum the United States desires for a stable power balance in the Indo-Pacific. As India faces potential sanctions over oil sales from Iran, many Indians perceive Trump’s decision as the United States hurting India’s national interests over its own personal enmities. Indeed, the fact that the Trump administration has shocked its European and NATO allies with its decisions has made Indians even more cautious of the United States’ dependability as an ally. Despite viewing India as a key power in its Indo-Pacific Strategy, Trump’s withdrawal from the JCPOA has hurt India’s interests vis-à-vis China, to the detriment of U.S. interests for maintaining a free and open Asia. Continued Indian engagement with Iran is in America’s best interest. Zoe Leung is senior associate with the Asia-Pacific program at the EastWest Institute. Hari Prasad is an independent researcher on Middle East/South Asia Politics and Security. Scrapping the nuclear deal will backfire. How Sincere Were Obama’s Threats to Stop Iranian Nuclear Proliferation?Even With a Waiver, Will Iran Sanctions Chill US-India Ties?India's Chabahar Challenge Gets SeriousWhat Does Trump’s Withdrawal From the Iran Nuclear Deal Mean for Afghanistan?What Does Trump’s Iran Deal Withdrawal Mean for India’s Security?